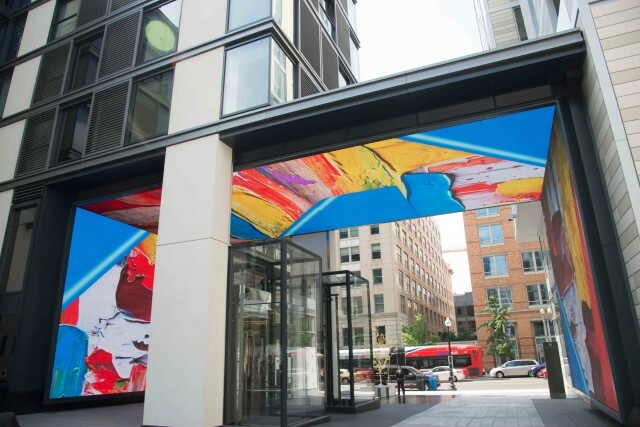 “Hines and Qatari Diar, developers of CityCenterDC, unveiled The Gateway at CityCenter, a groundbreaking three-plane, 25-foot high, 50-foot wide, ultra-high resolution, digital art feature that will serve as a focal point of CityCenterDC, the 10-acre mixed-use development located in the heart of the Nation’s Capital that is being transformed into a vibrant blend of residences, offices, shopping, restaurants, hotel and park. The imagery selection is ever-changing and completely non-promotional, without ads or commercials. It includes everything from whimsical dancers to picturesque natural scenery and unique views taken from famous local landmarks such as the Lincoln and Jefferson Memorials. The content also can be customized to celebrate holiday and seasonal events throughout the year and are complemented by soft atmospheric music designed to enhance but not overpower the visuals.